Home Top Doctors Could a Vaccine Be the End of Type 1 Diabetes? If the human body were like the economy, your blood sugar would be the local currency. Its value should be stable like the dollar, but type 1 diabetes makes it boomerang like Bitcoin. Sugar too high? You could go into a coma. Too low and you could die in your sleep. “It’s a horrible disease,” says Dutch immunologist Bart Roep. The symptoms often manifest in childhood, and if you are diagnosed before age five, “your prognosis is worse than if you had leukemia,” he adds. 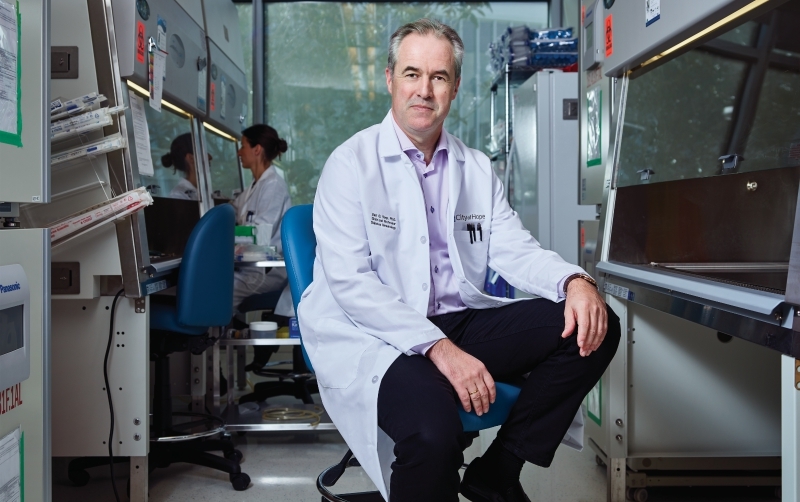 Determined to improve those odds, Roep left the Netherlands to join City of Hope hospital in Duarte in 2016 and now leads a project with the goal of curing type 1 diabetes (T1D) in six years. Such a tight timetable may sound, at best, ambitious, but City of Hope backs it with a $50 million grant and plenty of academic street cred. Although better known for its cancer treatment, the institution benefits from a legacy of pioneering diabetes research dating to the 1970s, when two of its scientists helped develop the first synthetic human insulin, the protein that regulates blood sugar. That insulin, which T1D patients must administer daily via syringes or pumps, has saved millions of lives, but it sheds no light on the disease’s origins. An autoimmune disorder, T1D arises when the immune system lays siege to the insulin-producing cells in the pancreas. (This is quite different from type 2 diabetes, which usually appears later in life, doesn’t involve the immune system, and is linked to lifestyle issues like obesity.) About 1.5 million Americans are affected by T1D, and the search for the root cause has turned up a skein of possible hereditary and environmental factors. For example, although more than 30 genes have been implicated, even identical twins of T1D patients have only a 30 to 50 percent chance of developing it themselves. The real question is why anything—genetic or otherwise—would make the body attack its own pancreas, and Roep has spent decades searching for an answer. Finally, in a game-changing study last year, he and colleagues in the Netherlands found one: Some pancreases are basically looking for trouble. Under stress, the insulin-producing cells may crank out a defective version that doesn’t resemble regular insulin, and when pieces of it are displayed on the surface of the cells (a common mechanism by which cells identify themselves to one another), what follows is akin to a gang member who flashes a rival hand sign and gets jumped by his own clique. Specialized immune system cells swarm to the misguided cells and light them up with tiny biochemical weapons. Roep’s solution? A diabetes vaccine. (No, diabetes isn’t contagious.) Think of it as an allergy shot—only instead of easing hypersensitivity to pollen or cat dander, this injection would thwart the disastrous overreaction to the funky insulin. “We teach immune cells to suppress their response,” Roep says. In theory it could be given even after symptoms appear. A trial to assess safety and tolerance looks promising in the Netherlands, and the vaccine’s effect on blood sugar regulation will be tested on City of Hope patients this year. If it works, we have a dietary recommendation: Let them eat cake. Next articleA Look Back at When a Black, Female Newspaper Editor Took on the KKK in L.A.